Brand: Fischl, Richard Michael/ Paul, Jeremy R.
Professors Fischl and Paul explain law school exams in ways no one has before, all with an eye toward improving the reader's performance. The book begins by describing the difference between educational cultures that praise students for 'right answers,' and the law school culture that rewards nuanced analysis of ambiguous situations in which more than one approach may be correct. Enormous care is devoted to explaining precisely how and why legal analysis frequently produces such perplexing situations. But the authors don't stop with mere description. 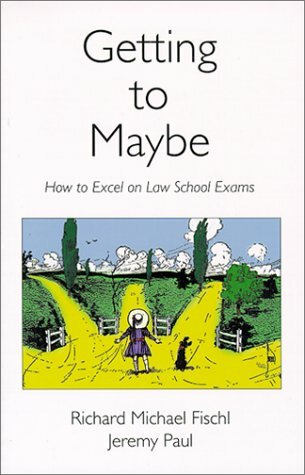 Instead, Getting to Maybe teaches how to excel on law school exams by showing the reader how legal analysis can be brought to bear on examination problems. The book contains hints on studying and preparation that go well beyond conventional advice. The authors also illustrate how to argue both sides of a legal issue without appearing wishy-washy or indecisive. Above all, the book explains why exam questions may generate feelings of uncertainty or doubt about correct legal outcomes and how the student can turn these feelings to his or her advantage. In sum, although the authors believe that no exam guide can substitute for a firm grasp of substantive material, readers who devote the necessary time to learning the law will find this book an invaluable guide to translating learning into better exam performance.